The San Diego State Aztecs football team represents San Diego State University in the sport of American football. The Aztecs compete in the Football Bowl Subdivision (FBS) of the National Collegiate Athletics Association (NCAA) and the West Division of the Mountain West Conference (MW). They play their homes games at SDCCU Stadium and are currently coached by Rocky Long. They have won twenty-one conference championships and three national championships at the small college division. They were scheduled to become a football-only member of the Big East Conference in July 2013, but on January 17, the Mountain West's board of directors voted to reinstate San Diego State. San Diego State University was originally two separate schools. San Diego Normal School had school colors of white and gold. San Diego Junior College had school colors of blue and gold. They decided to merge schools in 1921 to form San Diego State College. The first school colors of SDSC were blue, white and gold. During the 1921 school year they had their first football game. The central athletic figure at San Diego State at the time was Charles E. Peterson. He had originally been appointed in 1916 as a physical education instructor. After serving in World War I, President Hardy prevailed upon him to return and oversee the school's athletics program. Initially, Peterson taught all the men's physical education classes and coached all the intercollegiate teams. After the athletic teams were established in 1921, media referred to the teams as "Staters" or "professors". The school newspaper tried to encourage "Wampus Cats" during its coverage of the 1923–24 school year. In the fall of 1924, Athletic Director C.E. Peterson urged the students to select a nickname and the school newspaper, The Paper Lantern, invited suggestions. Over the next few issues, names such as Panthers, Balboans and Thoroughbreds were suggested and submitted to a committee of Dean Al Peterson, C.E. Peterson and a student. In 1925, student leaders chose the nickname "Aztecs" over such other suggestions as "Balboans". They felt the terminology was more representative of a southwest image and the selection met with no dissent. In February 1925, President Hardy gave his formal approval to the "Aztec" nickname and teams adopted that identity within a week. Purple and gold were adopted for the 1922–23 term but this became a problem because the colors were the same as St. Augustine High School. It didn't go over very well when one couldn't tell the difference between an Aztec letterman's sweater and a high school sweater. Also, purple and gold were the colors of Whittier College, a fierce conference rival at the time. Not to mention the fact that manufacturers of Aztec merchandise in that era refused to guarantee the color fastness of San Diego State's purple hues. Associated Students president Terrence Geddis led the movement for a change and, after pushing for reconsideration of school colors, students finally got a chance to vote on the matter in December 1927. That was followed by two days of voting the following month where students were to decide between Scarlet and Black and the previous colors, Purple and Gold. On January 19, 1928 the tally was 346–201 in favor of Scarlet and Black and it has remained that ever since. Don Coryell became the SDSC head coach in 1961, while in the California Collegiate Athletic Association. He led the Aztecs to two "small college" undefeated seasons in 1966 and 1968 and from the College Division (now Divisions II & III) to the University Division (Division I FBS) in 1969. San Diego State was a charter member of the Pacific Coast Athletic Association, which was founded on July 1, 1969. Coryell a total of 12 seasons with the Aztecs, using the philosophy of recruiting only junior college players. There, he compiled a record of 104 wins, 19 losses and 2 ties including a total of three undefeated seasons in 1966, 1968, and 1969. His teams had winning streaks of 31 and 25 games, and won three bowl games during his tenure. It was at SDSC that Coryell began to emphasize a passing offense and he recounted, "We could only recruit a limited number of runners and linemen against schools like USC and UCLA. And there were a lot of kids in southern California passing and catching the ball. There seemed to be a deeper supply of quarterbacks and receivers. And the passing game was also open to some new ideas. Coryell adds, "Finally we decided it's crazy that we can win games by throwing the ball without the best personnel. So we threw the hell out of the ball and won some games. When we started doing that, we were like 55–5–1. John Madden served as Coryell's defensive assistant at SDSC. Madden had first met Coryell attending a coaching clinic on the I formation led by McKay. "We'd go to these clinics, and afterward, everyone would run up to talk to McKay", said Madden. "Coryell was there because he introduced (McKay). I was thinking, 'If (McKay) learned from him, I'll go talk to (Coryell).' At San Diego State, Coryell helped develop a number of quarterbacks for the NFL, including Don Horn, Jesse Freitas, Dennis Shaw and future NFL MVP Brian Sipe. Wide receivers who went on to the NFL include Isaac Curtis, Gary Garrison, and Haven Moses. Coryell also coached two players who later became actors: Fred Dryer and Carl Weathers. Following the 1972 season, he moved to the NFL and became head coach of the St. Louis Cardinals. During the 1980s at San Diego State, the Aztecs were led by record-setting quarterbacks Todd Santos and Dan McGwire, who later became the tallest quarterback in the history of the NFL (in 1991). The Aztecs won the WAC Championship in 1986 and played at home in the Holiday Bowl against Iowa, but lost by a point 39–38. In 1990, the team played Miami in a game that featured violent fights and a near epic upset. Faulk received an athletic scholarship to attend San Diego State, and played running back for the Aztecs. Faulk was recruited by Curtis Johnson, and coached by Bret Ingalls and future New Orleans Saints head coach, Sean Payton. In one of the most prolific performances of his entire career, he ran all over the University of the Pacific in just his second collegiate game on September 15, 1991. In 37 carries, he racked up 386 yards and scored seven touchdowns, both records for freshmen (the 386 yards were then an NCAA record). "Faulk had scoring runs of 61, 7, 47, 9, 5, 8 and 25 yards." That performance sparked one of the greatest freshman seasons in NCAA history, gaining 1,429 yards rushing, with 23 total touchdowns (21 rushing), and 140 points scored. Faulk went on to better 1,600 yards rushing in his sophomore year. In Faulk's junior season in 1993, he was finally able to showcase his all-purpose ability by catching 47 passes for 640 yards and 3 touchdowns to go with 1,530 yards and 21 touchdowns on the ground. These numbers put Faulk 3rd in the nation in all-purpose yardage that year, and 2nd in scoring. Faulk left San Diego State with many of the school's offensive records, among them 5,562 all-purpose yards and 62 career touchdowns, which is the 8th most in NCAA history. After his 1992 season at SDSU, Faulk finished second in the Heisman Trophy award, losing to quarterback Gino Torretta in what was considered a notable snub in the history of the award Torretta's Miami Hurricanes had again gone undefeated in the regular season and was ranked No. 1 in the country before the Heisman balloting, Faulk's team finished with a middling 5–5–1 record, continuing a trend of the Heisman going to the most notable player on one of the nation's best teams. He was a Heisman finalist as well in 1991 (9th) and 1993 (4th). With a year of eligibility remaining, Faulk declared for the NFL draft and was the second overall selection in April 1994. In the year 2000, San Diego State became a charter member of the Mountain West Conference. In December 2008, Hoke was hired as the 17th head football coach at San Diego State University. Hoke signed a five-year contract with a guaranteed payment of $3,525,000, plus incentives for hitting revenue marks and bowl berths. San Diego State was also required to pay $240,000 to buy out the remaining two years on Hoke's contract at Ball State. San Diego State compiled a 2–10 record the year before Hoke arrived. In 2009, Hoke led the Aztecs to a record of 4–8. During the 2010 season, Hoke's team improved to 9–4. Two of the Aztecs' losses in 2010 came in close matches against ranked opponents. The Aztecs gave the undefeated, #2 TCU team its closest game of the regular season, losing by a score of 40–35. Hoke's team also lost a close game against No. 12 Missouri by a score of 27–24. The team concluded its season with a convincing 35–14 win over Navy in the 2010 Poinsettia Bowl. Prior to the 2010 season, San Diego State had not won nine games in a season since 1977 when they went 10–1 finishing 16th in the API and had not played in a bowl game since the 1998 team lost in the Las Vegas Bowl. After the 2010 season, a reporter for the Orange County Register wrote that Hoke had given San Diego State "swagger." After Hoke accepted the head coaching job at Michigan defensive coordinator Rocky Long was immediately named the new head coach. Rocky Long served as the head coach of New Mexico 1998–2008 where he compiled 65 victories and 5 bowl game appearances in 10 years. During his first 5 years as head coach of the Aztecs (2011–2015) he has led the Aztecs to 5 consecutive bowl games and won San Diego State's first MW title in 2012 (shared), followed by an outright MW Championship in 2015. As of January 1, 2016, he has a 43–23 overall record as head coach of the Aztecs with a 30–9 conference record. In 2015, San Diego State earned an 11–3 record under Long, culminating with an impressive 42–7 victory over Cincinnati. San Diego State has won two division championships, both during their tenure in the Mountain West Conference. SDSU is 8–9 all time in post-season bowl games. They first went to a bowl game in 1948 and first won a major-college bowl game in 1969. On November 29, 1981, San Diego State played the Air Force Falcons in the Mitsubishi Mirage Bowl at Tokyo Olympic Stadium in Tokyo, Japan which was a regular season game sponsored by the Mitsubishi Motors, losing 21–16. It is not considered a sanctioned bowl and does not reflect on San Diego States's all-time bowl record. The Aztecs (formerly "Staters") began playing football when SDSU was still known as San Diego Normal School and then San Diego State Teacher's College, and located on Park Boulevard in University Heights. During this period, the football team called Balboa Stadium home (formerly "City Stadium"). At the time, the seating capacity for Balboa Stadium was 15,000. It was later expanded to 34,000 capacity and served as the home stadium for the San Diego Chargers of the American Football League (AFL) from 1961 to 1966. After the University relocated from University Heights to its current location in 1931, accommodations were made on the new campus for a football stadium to be constructed beginning in 1933. The Aztecs played their home games in the on-campus Aztec Bowl during the 30-year period between 1936 and 1966. At the time of its completion in 1936, Aztec Bowl could accommodate 7,500 fans and was the only state college stadium in California. 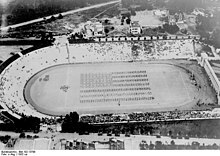 The stadium's capacity was later expanded to a seating capacity of 12,592 fans in 1948. Given the growth of the college and its fan base, the Aztecs found themselves in need of a larger venue. Rather than proceeding with the previously proposed expansion to 45,000 seats, Aztec fans would have to make do with this facility until 1966. During this final year in Aztec Bowl, the Aztecs won their first of three consecutive "small college" (Division II) National Championships. About 80% of Aztec Bowl was covered up (rather than demolished) in 1996 to make way for Viejas Arena at Aztec Bowl (formerly named Cox Arena), current home of the San Diego State Aztecs men's basketball and women's basketball teams. Formerly listed on the National Register of Historic Places, a portion of Aztec Bowl remains visible on the north side of Viejas Arena. Since its inception in 1967, SDCCU Stadium has been the home of San Diego State University Aztecs football. SDCCU Stadium (formerly San Diego Stadium, Jack Murphy Stadium, and Qualcomm Stadium) is a multi-purpose stadium located in the Mission Valley area of San Diego, about 5 miles from campus. The campus and stadium have been connected by the San Diego Trolley since 2005. SDCCU stadium had also been home to the NFL's San Diego Chargers from 1967 to 2016, and also hosted the San Diego Padres from 1969–2003. It also hosts the Holiday Bowl and hosted the San Diego County Credit Union Poinsettia Bowl college football games every December. The stadium has hosted three Super Bowl games, two Major League Baseball All-Star Games, and two World Series. It is the only stadium ever to host both the Super Bowl and the World Series in the same year (1998). Playing in a professional sports facility provides some benefits including improved concessions, luxury suites, "jumbo-tron" screens and other amenities for Aztecs fans. However, the increasing capacity of the stadium (from 52,596 in 1967 to 70,561 in 2015) has created a mismatch for a college football program that drew an average of 29,065 fans to home games in 2015—during an 11–3 MW Championship season, which was their best performance since joining Division I in 1969. Even the best matchups provide a tepid fan experience in a facility that is filled to only 40% of capacity. The Aztecs now tarp off significant sections of the upper seating bowl for their games, creating a reduced capacity of 54,000. In 2015, the San Diego Chargers stepped up their efforts to relocate to Los Angeles, pending a vote of National Football League owners and a partnership with the Oakland Raiders or St. Louis Rams. In the face of this development, contingency plans have been generated for the future use of the current SDCCU Stadium site in Mission Valley. One proposal that has been put forward by State Senator Marty Block is for San Diego State to take over use of the site in order to expand the campus and also provide for a new multi-use 40,000-seat stadium for Aztecs football and a Major League Soccer team. There happened to be two plans for the newly proposed stadium: SDSU West, a plan to help expand the campus to Mission Valley and create a stadium built primarily for San Diego State athletics, as well as new educational facilities for students; and then your have Soccer City,an organization that favors building a new stadium entirely that would house both San Diego State athletics and an MLS soccer team. On January 13, 2016, the Chargers gained approval by the NFL to join the Rams in a move to Los Angeles. On January 12, 2017, the Chargers announced that they would move to Los Angeles for the 2017 season. On November 6th, 2018, SDSU West would be approved on the San Diego ballot, besting Soccer City (committee supporting the MLS soccer route instead of expanding the campus and making a on-campus stadium). Night games have become a San Diego State University football tradition. The first SDSU night game was played on September 25, 1930 at Lane Field. Over 5,000 fans attended the game to watch the Aztecs beat the San Diego Marines 39–0. Since that day, over 75% of all Aztec games, home and away, have been played at night. The first Aztec Warrior figure associated with the university initially appeared at a San Diego State athletic event over six decades ago. Art Munzig played the original role in a skit during halftime at the San Diego State-Pomona football game kicking off the 1941 football season. The school's Rally Committee came up with the idea based on the ruler of the Aztec empire in the early 1500s, Moctezuma II. The character, affectionately known as "Monty" to generations of SDSU alumni, evolved through the years to become emblematic of San Diego State's athletic teams. For decades the role was filled mostly by students, who inspired enthusiasm and school spirit during football and basketball games. In 1983, however, Director of Athletics Mary Hill directed Montezuma to adopt a more dignified persona. During that football season, Monty sat atop a pyramid among his attendants on the sidelines at Jack Murphy Stadium. That lasted one year. The next season Moctezuma resumed his more traditional role of involvement and encouragement of Aztec football fans. Beginning in 2000, some student groups began to propose the university alter its Aztec identity. The new mascot made his first public appearance February 23, 2004 to reveal some costume changes and the modified moniker, "Aztec Warrior." For all but a very few years from the early 1990s through 2006, Carlos Gutierrez took over the role of mascot, raising the position's profile and expanding public appearances throughout the San Diego community. In April 2006, the SDSU Alumni Association sponsored student auditions for a new Aztec Warrior. The team accompanied by the San Diego State Marching Aztecs Drumline, additional members of the spirit squad, and fans walk from the stadium parking lot to the tunnel which leads the team onto the field. This usually occurs two hours before kickoff. An honorary team captain, usually a former player of the team, leads the team onto the field before kickoff. An Aztec warrior shield that the accompanies the team on the sidelines during home and away games. The shield is held high by the captains during the singing of the Fight Song following victories. The rivalry trophy between the Aztecs and the Bulldogs of Fresno State. The tradition is relatively new having taken place for the first time in 2011. The winner of the game gets the trophy. No other opponent has a more extensive history against SDSU. The Fresno State-San Diego State rivalry, also known as the Battle for the Oil Can, dates back to 1923 when the two teams competed in the SCJCC. The Aztecs winning the initial meeting 12–2 at home. Since then, the sides have met 51 more times, including every year from 1945–79, when the two competed in the same conference or were independents. After not facing one another between 1979–1991, the schools resumed the annual series from 1992–98, when both were members of the Western Athletic Conference. The two teams have met twice since then, in 2002 and 2011. With Fresno State joining the Mountain West Conference in 2012 and the addition of the divisional format, the Aztecs and the Bulldogs will compete on an annual basis once again. One of the most memorable games between the two schools was known as "The Fog Bowl" in 1962. The fog was so thick that the Aztec radio announcer at the time Al Couppee couldn't see the plays, so he went down to the field and into the huddle to give the play-by-play. The Aztecs won the game 29–26 in a thrilling fashion. The two schools started competing in 2011 for the Oil Can trophy. The Oil Can trophy comes from a 1930s-era oil can hailing from Fresno that was found at a construction site at San Diego State. "The oil can likely came from a time when Aztec and Bulldog fans traveled to football games between the two schools via the old, twisting, precipitous Grapevine section of Highway 99 over Tejon Pass", said Jacquelyn K. Glasener, executive director of the Fresno State Alumni Association. "Cars in those days carried extra oil and water to be sure they could make it through difficult trips", added Jim Herrick, executive director of the San Diego State Alumni Association. The game was dubbed by fans the Battle for the Oil Can. The first trophy game was played in 2011. The Aztecs were favored but however they found themselves trailing 21–0 in the first half. They battled back scoring four unanswered touchdowns to win 35–28, with Ronnie Hillman scoring the go-ahead touchdown in the fourth quarter to win the game. The Aztecs ended the season with an 8–4 record and made it to the New Orleans Bowl and the Bulldogs ended the season 4–8. San Diego State leads the all-time series with a record of 27–22–4, including a 14–11–2 mark in San Diego, Fresno State leads the trophy series 3–2. In 2016, the series is tied. Fresno State assumed a 4-2 lead in the trophy series with their 27-3 victory over the Aztecs on October 21, 2017 at SDCCU (formerly Qualcomm) Stadium. Fresno States leads the series 29–24–4 as of October 21, 2017. San Diego State has retired four numbers. Announced schedules as of March 7, 2017. Joe Gibbs – Hall of Fame NFL head coach of the Washington Redskins, Super Bowl winning coach, NASCAR team owner, former Aztec player and assistant coach. John Madden – Hall of Fame AFL/NFL head coach of the Oakland Raiders, Super Bowl winning coach, longtime NFL broadcaster, and namesake of the Madden video game series; former Aztec assistant coach. Don Coryell – Former NFL head coach of the San Diego Chargers, former Aztec head coach. Ted Tollner – Current NFL assistant coach for the Oakland Raiders, former assistant coach of the Detroit Lions, San Francisco 49ers and San Diego Chargers, former Aztec head coach. Herman Edwards – NFL head coach of the New York Jets and Kansas City Chiefs, former Aztec player. John Fox – Former NFL head coach of the Chicago Bears, former NFL head coach of the Carolina Panthers and the Denver Broncos, former Aztec player. Marshall Faulk – Hall of Fame, 7-time Pro Bowl running back for the Indianapolis Colts and St. Louis Rams. Dennis Shaw – 1970 AFC Offensive Rookie of the Year, played eight years in the NFL for the Buffalo Bills, St. Louis Cardinals, New York Giants, and Kansas City Chiefs. Dan McGwire – QB was the 16th pick in 1991 by the Seattle Seahawks, playing six years in the NFL. Dan is the brother of former Major League slugger Mark McGwire. Brian Sipe – NFL quarterback; part of the "Kardiac Kids" for the Cleveland Browns. Isaac Curtis – 4-time Pro Bowl wide receiver for the Cincinnati Bengals. Kirk Morrison – Linebacker for the Buffalo Bills. Kassim Osgood – 3-time Pro Bowl wide receiver and top special teams player for the San Diego Chargers and Jacksonville Jaguars – All American transfer from Cal Poly. Roberto Wallace – NFL wide receiver for the Miami Dolphins. Fred Dryer – NFL defensive end for the New York Giants and Los Angeles Rams. Film and television actor, notably starring in the series Hunter. Ronnie Hillman – NFL running back for the Denver Broncos, drafted in the third round of the 2012 NFL Draft. Miles Burris – NFL linebacker for the Oakland Raiders, drafted in the fourth round of the 2012 NFL Draft. Ryan Lindley – NFL quarterback for the Arizona Cardinals, drafted in the sixth round of the 2012 NFL Draft. Kabeer Gbaja-Biamila – NFL defensive end for the Green Bay Packers, drafted in the fifth round of the 2000 NFL Draft, later inducted into the Green Bay Packers Hall of Fame. La'Roi Glover NFL 14-year defensive lineman for Oakland Raiders, New Orleans Saints, Dallas Cowboys, St. Louis Rams. Inducted into the Saints Hall of Fame. Multiple Pro Bowl and All Pro seasons. Current Director of Player Engagement for Los Angeles Rams. ^ Color Palette (PDF). San Diego State Athletics Style Guide. November 27, 2018. Retrieved March 13, 2019. ^ "San Diego State Conference Championships". Archived from the original on 2010-11-25. ^ "San Diego State Recognized National Championships". Archived from the original on 2012-10-19. ^ "Don Coryell named head coach of St. Louis grid Cards". Bangor Daily News. Maine. Associated Press. January 19, 1973. p. 16. ^ Samantha Stevenson (1990-12-02). "COLLEGE FOOTBALL; Miami Survives Scare and Brawl". The New York Times. ISSN 0362-4331. Retrieved 2016-01-21. ^ "Miami survives scare by Aztecs". Eugene Register-Guard. Oregon. wire reports. December 2, 1990. p. 4G. ^ "San Diego State Bowl History". College Football Data Warehouse. Archived from the original on 2012-11-04. Retrieved 2012-11-30. ^ "Senator says SDSU should take over Qualcomm Stadium". The Daily Aztec. Retrieved 2016-01-19. ^ "2012 San Diego State Football Media Guide by Jamie McConeghy". issuu. Retrieved 2016-02-20. ^ 1 second ago. "San Diego State Official Athletic Site – Football". Goaztecs.cstv.com. Retrieved 2016-02-20. ^ "NFL – Players Rosters – National Football League". ESPN. Retrieved 2016-02-20. ^ "San Diego State Future Non-Conference Schedule". Wikimedia Commons has media related to San Diego State Aztecs football.